I know I already showed you my photos of my hollyhocks, but it wasn't enough for me to photograph them. I had to paint them! Painting is an addiction for me. Really. I have so many things I want to paint and not enough time to paint them. Oh well. All things in moderation, right? They look darling in a little white frame. If this one doesn't sell, it will hang up in our guest room I think. So girly and pink. I love it! Very very nice!I like it! Beautiful flowers, so soft and delikate. They look awesome in this white frame! Ah so pretty! I love the soft, sweet quality of it. Thanks for your encouraging words at my blog--I'm glad to be back! Have a great Wednesday. Lovely! You're so talented. Hope you get lots of time to paint, even if it's in little stretches here and there. How about a light green mat and a bigger frame? 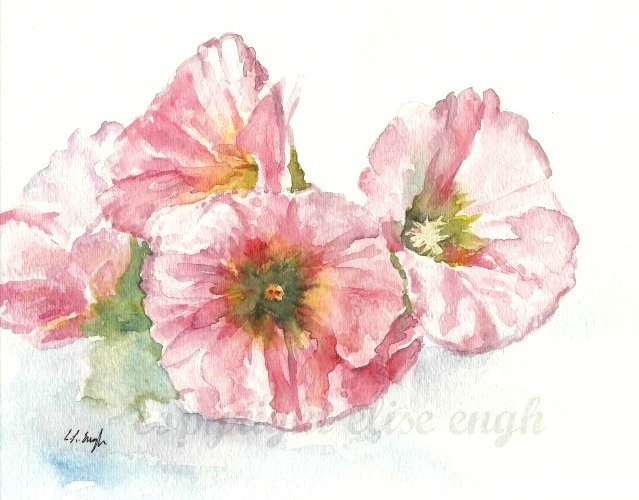 Your painting of Hollyhocks is "over the top" gorgeous ! So delicate and your color choices are so soft and real.